, I. Steinbach, F. Varnik. Comparison of typical tangential melt velocity profile near the solid-liquid interface in the case of diffuse interface and sharp interface. Fluid dynamical equations in the presence of a diffuse solid-liquid interface are investigated via a volume averaging approach. 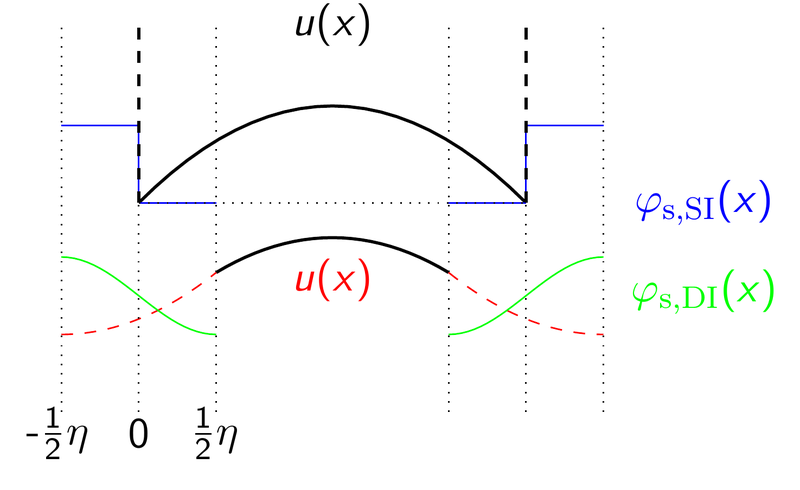 The resulting equations exhibit the same structure as the standard Navier-Stokes equation for a Newtonian fluid with a constant viscosity, the effect of the solid phase fraction appearing in the drag force only. This considerably simplifies the use of the lattice Boltzmann method as a fluid dynamics solver in solidification simulations. Galilean invariance is also satisfied within this approach. Further, we investigate deviations between the diffuse and sharp interface flow profiles via both quasiexact numerical integration and lattice Boltzmann simulations. It emerges from these studies that the freedom in choosing the solid-liquid coupling parameter h provides a flexible way of optimizing the diffuse interface-flow simulations. Once h is adapted for a given spatial resolution, the simulated flow profiles reach an accuracy comparable to quasiexact numerical simulations.